Mililani Uka Elementary student Karli Murakami winced in anticipation yesterday as she received a nasal dose of flu vaccine. State officials' mission to eventually vaccinate every child in Hawaii against the flu started yesterday with a spray of mist up the noses of hundreds of children. The spray is 9-year-old Cyrus Noveloso's preferred choice of flu vaccination "because it doesn't hurt. It just tickles," he said at Mililani Uka Elementary School. The state Health and Education departments teamed up to promote flu vaccination, starting with three schools in Mililani. "Kids are the biggest germ spreaders, if you think about the nature of who they are, what they are, where they go," said Sarah Park, deputy chief of the state Disease Outbreak Control Division. "They're in much closer contact to each other than most of us adults are to each other." Park said that starting at the school level would decrease the number of absentees in the classroom. If children are sick and parents cannot find day-care alternatives, the parents would stay home and expose themselves to the flu. It is a ripple effect that is magnified by Hawaii's geography, Park said. "We're such a small community relative to the world, and the world is coming to us constantly," Park said. Registered nurse Elizabeth Bucasas explained yesterday to a Mililani Uka Elementary student that the syringe of flu vaccine had no needle and would be administered nasally. Other schools that participated in the pilot program were Mililani Waena and Mililani Mauka elementary schools. Of the estimated 730 students at Mililani Uka Elementary, only about 200 participated in the pilot program. Part of it was timing, Principal Heather Wilhelm said. Wilhelm said many of the students already had their flu shots at the beginning of the school year, while others preferred to go through their medical provider. 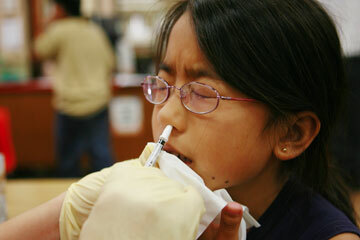 But many parents were receptive to free vaccinations at parent-teacher group meetings, Wilhelm said. And free vaccinations can prevent absentees. "When the kids feel ill, they lose that valuable instructional time," Wilhelm said. Park said getting the official green light for the pilot program delayed its start, but she stressed that Hawaii has a year-round flu season because of the large influx of mainland visitors. The state Health Department also sent home surveys for parents, which would include information on where they prefer to have their child vaccinated and when their child is normally vaccinated. With the data collected, the Health Department will determine whether to grow the program. The biggest roadblock would be the cost of vaccinating Hawaii's more than 240,000 schoolchildren, which has yet to be determined. "It's my dream that we would be able to do this for all kids," Park said. "I'm optimistic, but there's still a lot of work ahead of us."